the Resort at Sunny Isles Beach introduces an elegant European Riviera-style luxury that is little known in the Americas. This staggering Sunny Isles Beach resort offers absolutely the most exclusive resort vacation on the east coast and easy access to all of what South Florida is known for. All this is at the door step of one of the resort’s most sought after vacation rental properties, and exclusively through this site. With a 6,000-sq-ft spa for massages, facials and pedicures and just about every detail of personal luxury, the resort also offers Milanese-inspired fare at the Restaurant and in-suite kitchens perfect for entertaining or for late night snacks. 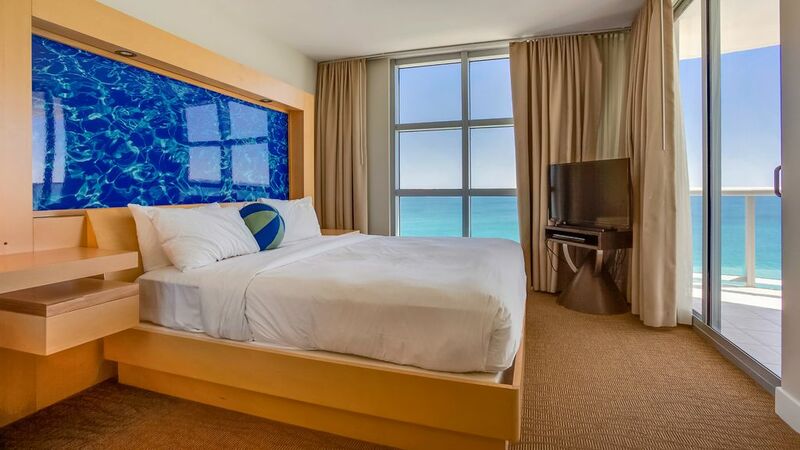 With stunning ocean views throughout the resort, every suite has been decorated in pale wood, stainless steel, and frosted glass for a clean modern finish. This condo comes complete with a unique Italian-inspired kitchen, washer/dryer, and a fresh spacious living area. As part of the most well regarded resort in the city of Sunny Isles Beach, this luxury condo includes a number of extras and luxury amenities almost too numerous to mention. WiFI and room service, and an on-site restaurant and bar as well as heated Swimming Pool and Jacuzzi are really just the beginning of a 5 Star Vacation at a fraction of the cost of a luxury hotel. With 2 ample bedrooms and 3 full baths, this vacation condo will comfortably accommodate 6 adults in well-suited luxury. Sunny Isles Beach has never looked so promising. Fully furnished and ready for business or vacation travelers, one of our Sunny Isles Beach vacation representatives will be happy to discuss your travel plans at your earliest convenience. * Guest's must register a credit card with the hotel in order to enjoy some of these services such as Room Service. If you have any questions please feel free to contact us! * Free Wireless Internet Access. Must be requested at the Front Desk. * Telephone Line with local calls. * Heated Swimming Pool and Jacuzzi. Valet parking, access to the gym , jacuzzi, pool bar. Property is nice , view is quite nice. The place needs a little more detail to cleaning . The building is very crowded. The use of elavators may take up as much as 15 minutes. Restaurants are not good. Great resort and very friendly staff. The condo is in good shape but needed a few repairs. Great views but the advertisement was for ocean front view and it was mainly the intercoastal which was lovely as well, just a bit misleading. We loved the location directly between South Beach and Ft Lauderdale. The sink in the master leaked, there were multiple light bulbs that were out, the dryer squeaked so loud it was not usable while in the condo. The resort itself is awesome, this specific unit, was Not good at all. The staff at the resort = amazing and friendly and helpful. The location wasn’t ideal for us, we have a 20 month old but it was fine. The location in terms of beach access, perfect and the view from the balconies were great!!! This specific unit, private ownership was badddddd. Barely any of the lights worked, the door to the balcony was basically impossible to open, there were no batteries in the tv remotes or smoke detector, and the water took forever to get hot (never did in the kitchen at all), the cleaning staff left thei vacuum and have NEVER dusted the headboards, the clutter on the dryer was dangerous, the bathtub didn’t work in the first room, the showers don’t drain and have broken pieces, that’s all I can remember right now. It all added up to be annoying for the amount of money we paid. Plus you have to pay $53 (plus taxes) so that just added to the cost, and it just seemed like the owner just does not care that his property is in bad condition and is fine just making all this money without ever maintaining the unit. We were not able to stay in this room, but we had to pay for it. Extremely dissatisfied! Beware. I want to first say, that we have stayed in many rental properties over the years, and have never left a bad review of one place. We are not hard people to please and totally understand that unfortunate things happen. Upon our arrival at 7pm, the room was a complete mess. There was trash everywhere, old food and dishes completely filling the sink & the tables. All of the sheets were dirty and all over the floors. The trashcans were full of trash. It looked like a hurricane had come through the apartment. We tried to contact home away and the owner for nearly 2 hrs. From 7-9 pm, with no help coming from either home away or the owner... so, we 3 adults cleaned this very dirty apartment for 2 hrs. We washed sheets, took out trash, and cleaned the entire apartment. The only thing we had left to do to, was to vacuum; but there was not a vacuum in the unit and we could not get one from the hotel. The front desk wanted to help us, but couldn't because this is a privately owned unit. The owner finally called us back, and told us they could move us to a bay facing unit, and would move us back to this room in the morning. They told us that they did not want us to stay in this unit without it being cleaned by their cleaning service. We took a continuing education course from 8am -6:30pm the following day, @ 5 miles from the hotel. We knew that after class, we would be tired, needing to eat dinner, and prepare for the next day of early morning class. We explained this to the owner, and she said "no problem, we will move all of your things back into this unit tomorrow morning after it is cleaned". We returned to the hotel late the following evening to find that none of our things were moved into the room we paid for, and the room keys did not work. We did not feel like trying again to contact the owner for 2 hrs for a second night in a row. We ended up staying in the bay front unit, that had a tiny view of the ocean in one corner of the patio. Since then, I have tried several times to contact the owner to see if they would make some type of adjustment to the price. The owner will not contact me back, which I think is such poor customer service. We were thankful to have a room to stay in, without having to pay for another room. But, it was very disappointing that the owner did not do what she said would do, and has made no effort to apologize or make it right in any way. We paid for this very nice unit, but were not able to stay in it. I reserved this unit to rent from Frank Escalon and paid in full months ago for Memorial Day Weekend 2016. Yesterday, I unexpectedly received a one sentence email saying my reservation has been cancelled and my money refunded. This is NINE days before our family trip after I reserved it in the beginning of MARCH. The property manager told me that the owner decided he wants to stay in the unit. The owner, Mr, Escalon, is not replying to my emails or phone messages. We have paid for 6 plane tickets, car rental, arranged dog boarding, arranged for time off from work and for kids to miss school, etc! It is a holiday weekend and we are a family of 6 with kids and it is impossible for us to find a comparable rental in 9 days. I would also like to add this to my complaint. I called Marenas Resort directly to see if they had any other 2 bedrooms available when I received this cancellation email. They said no. Then about 4 hours after my reservation was cancelled, I saw my exact unit on hotels.com listed as "just added" for THREE times the amount that I rented it for. Disgusted and frantically looking now for a place to stay.